This paper conducts an empirical analysis of trends in interstate military competition. It gauges the perceptions and intentions, capabilities, and conflict activities of leading military powers in the international system for the period 2008-2018. Its principal conclusion is that interstate military competition is intensifying, and can be expected to continue doing so for the foreseeable future. In official defense and security documents, the security environment is increasingly characterized in competitive terms while non-allied states are cast in a more antagonistic light. The use of military threats has increased, especially by the major powers. While military expenditure has not seen dramatic increases at the global level, leading states have started allocating more funding to their armed forces, following significant increases in the defense budgets of Russia and China. At the same time, the modernization of armed forces enjoys greater priority across the board. China and Russia have set course on a dedicated path to military modernization for over a decade now. The US similarly continues to be strongly committed to military modernization. In addition to the incremental renewal of their armed forces, all three powers pursue disruptive innovation too, in recognition of the potentially game-changing impact of AI on the future military balance of power. Leading European states, with the exception of the UK, are reversing direction and are gradually raising their procurement and military R&D budgets. Finally, internationalized intrastate conflict has increased dramatically, quintupling over the past decade. This carries considerable risk of escalation from indirect to direct state-on-state conflict. The key implications for the Netherlands of increasing military competition reside in the risks to the territorial and economic security of the Netherlands and its allies, and the erosion of international law. The various signs of brewing interstate military competition are troubling, to say the least. The darkest scenario is that in which military competition culminates in large-scale military confrontation between the leading states, upending a three-quarters-of-a-century-long stretch without a war between great powers. But even if the major powers succeed in steering clear from such a cataclysm, the implications of increased military competition are considerable. 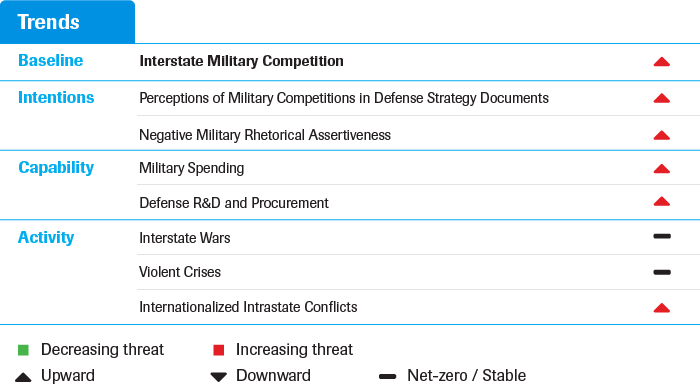 Military competition carries substantial financial and economic costs. It has been estimated that the US spent $5.48 trillion on the nuclear arms race with the Soviet Union in the twentieth century.﻿ Military competition also hurts global trade. It creates uncertainty in global markets and contributes to the fragmentation of the global economy. For fear of vulnerability to foreign intrusion, states nationalize control over vital national infrastructures and impose restrictions on the import and export of technologies critical to national security. This fear thus prompts protectionism and sovereignism across the world. In an uncertain world, governments become more sensitive to securing the supply of critical materials, further fueling a zero-sum dynamic. Meanwhile, increased uncertainty leads multinational corporations (MNCs) to geographically diversify their horizontally integrated supply chain networks.﻿ Military competition thus poses a direct threat to flow security.﻿ Because the Netherlands is increasingly intertwined with the rest of the world, interstate military competition will significantly affect Dutch security and prosperity. This study examines trends in interstate military competition over the last ten years and assesses the risks to Dutch national security. In gauging trends in interstate military competition, this paper first examines official perceptions of the security environment and competitive verbal behavior in the military arena through a selection of leading states in the international system. This selection includes the US, China, and Russia, as well as France, Germany, and the UK as the three foremost European military powers.﻿ It proceeds with an assessment of the actual build-up of military capabilities of these states through a concise assessment of their defense expenditures, military procurement, and military R&D activities. It then turns to an analysis of de facto engagement in military activities where these capabilities are deployed. The subsequent sections analyze these components in order to assess interstate military competition in the current international system. The paper concludes with a preliminary appraisal of the potential implications for Dutch national security. It is not just the perception of leading states that has changed. Over the last few years, the number of threats issued by the political leaders of key state actors has increased. The use of competitive and even aggressive language in the military domain has become more common, with political leaders even hinting at the use of nuclear weapons. In November of 2015, Russian President Vladimir Putin stated that he had been ready to put Russia’s nuclear forces on alert during the Crimea Crisis of 2014, leading to a strong rebuke from then US Secretary of Defense Ashton Carter demanding that Russia cease “nuclear saber rattling.”﻿ At the 2017 UN General Assembly, President Trump threatened to “totally destroy” North Korea in an exchange of threats with North Korean leader Kim Jong-un.﻿ China also frequently engages in hostile rhetoric with India over the contested Doklam area,﻿ and in April of 2018, the UK and France, alongside the US, threatened to use airstrikes against the Syrian regime in response to the massacre in Duma.﻿ These examples do not occur in isolation. Rather, they are part of a broader trend in which key international actors increasingly deploy threatening language in the military domain. To measure this trend, we used the Global Database of Events, Language and Tone (GDELT). From more than 100,000 news sources, this dataset records events that occur across the globe, and classifies these into one of its 310 categories.﻿ We consider the number of instances of negative military rhetorical assertiveness, for example when a state threatens to use weapons against another state.﻿ Overall, there was a 10.3 percent increase in the number of instances of negative rhetorical assertiveness between January 2015 and September 2018. Most of this increase is visible after July 2017 (see Figure 1). Overall, this concise overview warrants the conclusion that leading states perceive military competition to be heating up. At the same time, the use of verbal threats in the military domain by political and military leaders has also become increasingly common. The deterioration of perceptions of the security environment is starting to be matched by efforts on the parts of leading states to increase their military capabilities. China and Russia have been engaging in extensive military build-up and modernization programs over the period under consideration. The US continues to be the top spender, allocating more of its budget to the military than the next seven states combined. European states, which had been falling behind, have recently started to invest more in the build-up and modernization of their military capabilities. Figure 3 shows that between 2008 and 2018 global military spending increased by $160 billion, to $1.72 trillion in total.﻿ This 10.4 percent increase is largely the result of absolute GDP growth, however, rather than additional defense outlays. China is responsible for the lion’s share of this increase: the country doubled its military spending over the past decade, from $120 to $240 billion. According to official data, Russia’s military spending increased between 2008 and 2016 by 71 percent. After a twenty percent decrease in 2017, Russia’s official 2018 defense budget is $66 billion. Experts have noted, however, that a significant proportion of Russian military spending is hidden in a variety of sections of the budget. When this is taken into account, there is actually a slight increase in military spending in recent years.﻿ US defense spending declined in 2010 and 2014 by about 8 percent, only to slightly increase again from 2017 onwards, with the 2018 budget ultimately totaling $609 billion. This pattern is set to continue in 2019, as an additional $40 billion has been allocated.﻿ As for European states, after decades of shrinking defense budgets, overall defense expenditures increased by 9.5 percent between 2014 and 2018. France increased its military spending between 2014 and 2018 by 8.9 percent, to $57.8 billion, and in similar fashion, Germany increased its military spending over the same period by 14.5 percent to $44.3 billion. Similar to the US, this increase in spending is likely to be continued in the near future. France is looking to increase its military budget for 2019 by $2 billion, whereas the German budget will increase by $4 billion.﻿ For the UK, however, spending between 2014 and 2018 decreased, from $48.8 billion to $47.2 billion. Overall, military spending has not dramatically increased across the board, but Figure 4 shows that—with the exception of the UK—leading states have started increasing defense budgets again. Another important indicator of interstate military competition is the extent to which states invest in the procurement of new weapon systems and platforms, as well as allocate funds to research and development (R&D) of next generation military technologies. A review of the military procurement and military R&D budgets of leading military states shows that, after a period of relative stagnation, these budgets are increasing again. Percentage of military budget dedicated to equipment procurement and R&D for NATO members. The analysis shows that when it comes to military modernization, interstate military competition seems to be gaining momentum. Russia and China have been pursuing a path of military modernization through the persistent implementation of large-scale programs. The US has recently reinvigorated its already strong commitment to modernization and innovation, in light of the potential disruptive effects associated with AI. Leading European states, meanwhile, have been reversing course and are, albeit incrementally, stepping up their efforts in this domain too. Cyberspace is famously opaque, and many cyber operations are covert in nature. It is unclear how many cyber-attacks are actually taking place. What is clear though, is that states are building up their cyberspace capabilities. Cyberspace has been designated as a new operational domain by military organizations. In 2000, only five countries had entities located within their military structures tasked with engaging in cyber operations—by 2017, there were 63 countries with such entities as a clear sign of cyberspace’s increasing relevance to the military domain.﻿ US Cyber Command, which was only founded in 2010, states in its most recent vision that it commits to “building the operational expertise and capacity to meet growing cyberspace threats.”﻿ NATO plans to set up a new military cyber command center by 2023.﻿ States are investing in human capital to shore up their cyber capabilities. French President Emmanuel Macron announced that France seeks to employ an additional thousand cybersecurity experts.﻿ The UK has plans to train over two thousand cadets per year to improve the UK’s cyber capabilities.﻿ China will establish four to six cybersecurity departments in its universities as training grounds for cybersecurity professionals to serve in China’s Strategic Support Force (SSF) within the PLA.﻿ Assessing the build-up of national cyber capabilities remains difficult, however. Alexander Klimburg, Director of the Global Commission on the Stability of Cyberspace (GCSC) Initiative, has observed that “states are only left with the ability to presume—basically to guess— the overall capability of another State […] unless the intelligence assessment is very complete.” ﻿ The authors of this report therefore refrain from evaluating the degree of military competition in the cyberspace domain but recognize its growing importance in interstate military competition. Although the number of direct military confrontations has remained relatively stable, indirect military confrontation has become more frequent. States have been actively intervening in a growing number of intrastate conflicts. Instead of engaging with their adversaries directly, they provide financial, material, and military support to different parties in internationalized intrastate conflict. Based on calculations using data from the Uppsala Conflict Data Programme, it was concluded that the number of internationalized intrastate conflicts quintupled between 2007 and 2017. When compared to internal conflicts and interstate conflicts, internationalized intrastate conflicts constituted eleven percent of all conflicts in 2007, but 39 percent of all conflicts in 2017. Figure 6 shows the increase of internationalized intrastate conflicts over time. Overall, this concise review of the present military activity shows that direct state-on-state conflict, traditionally referred to as interstate war, remains relatively infrequent, but that internationalized intrastate conflict is increasing, which leads to indirect contact between states. Thus far this has not escalated into full-blown war, but the risk of friction leading to armed confrontation is real. This paper has examined trends in interstate military competition over the past decade by gauging the perceptions and intentions, capabilities, and activities of leading powers in the system. The principal conclusion that emerges from our analysis is that interstate military competition is increasing and can be expected to continue doing so over the next few years. Leading states characterize the security environment in competitive terms and have cast non-allied states in a more antagonistic light in their official defense documents. The use of threatening language in the military domain has also increased, especially among the major powers. Military expenditure has not seen as dramatic an increase. However, with the exception of the UK, leading states have started allocating more funding to their armed forces, following significant increases in the defense budgets of Russia and China. At the same time, the modernization of armed forces enjoys greater priority across the board. China and Russia have set course on a dedicated path to military modernization for over a decade now, while the US similarly continues to be strongly committed to military modernization. In addition to incremental renewal of their armed forces, all three powers pursue disruptive innovation too, recognizing the potentially game-changing impact that AI may have on the future military power balance. Leading European states have shifted direction, and are gradually raising their military R&D outlays. Finally, our examination of activity reveals a large increase in the number of internationalized intrastate conflicts, which carries considerable risk of escalation from indirect to direct state-on-state conflict (see Figure 7). The key implications for the Netherlands lie in the risks posed by interstate military competition to the territorial and economic security of the Netherlands and its allies, and the violation of international law. First, increased military interstate competition poses a continuing threat to the territorial sovereignty of NATO allies, especially on Europe’s eastern borders, which is relevant in the context of Article 5 which binds NATO members to collective defense. The probability of a Russian attack has certainly diminished since NATO has stepped up its enhanced forward presence along Europe’s eastern borders, but it remains within the realm of the possible.﻿ The impact of a violation of a NATO ally’s territorial sovereignty would be considerable, while its second-order effects—a direct military confrontation with Russia—could potentially be catastrophic. Second, increasing military competition is likely to prompt states to implement further protectionist measures for national security purposes. The probability of this is very likely—simply because of the fact that this is already happening. US President Donald Trump, for instance, signed the National Defense Authorization Act (NDAA) in August 2018. The NDAA banned the US government or anyone that wants to work with the US government from using components from Huawei, ZTE, and a number of other Chinese communications companies.﻿ Similarly, in September 2017, Trump, acting on a recommendation from the Committee on Foreign Investment in the US, prevented the Chinese take-over of Lattice Semiconductor, because it was involved in the production of essential components for military technology.﻿ The renewal of US sanctions against Iran following the US withdrawal from the Joint Comprehensive Plan of Action in May 2018 is another direct consequence of interstate military competition. The impact on Dutch economic interests of such protective measures is minor to moderate. Dutch corporations are penalized if they do business with states such as Iran, in that they no longer receive access to the US market. What is more, financial service institutions are no longer allowed to cater to these corporations, presenting these firms with a twofold setback. At the moment of writing it is not yet clear whether the European special purpose vehicle (SPV) to shield European firms trading with Iran from US sanctions will work. Overall, the precise costs of these protectionist tendencies require further study, but they are certainly not to be underestimated and are likely to grow should military competition increase. Fourth and finally, in the context of internationalized intrastate conflict, international law is challenged and violated. States participating in internationalized intrastate conflict do not always do so on the request of the receiving state or with a United Nations Security Council mandate. Meanwhile, governments that seek to hold on to power make use of war tactics that are in direct violation of the Geneva Conventions. This manifests itself in various ways, amongst others through the frequent targeting of non-combatants, including children, and the use of weapons that have been outlawed by international regimes, such as chemical weapons and cluster munitions.﻿ The probability of this happening is very high— because it is already been part and parcel of state behavior in contemporary conflict hotspots—and the impact is considerable. In conclusion, interstate military competition has been heating up over the past few years. Regrettably, there are few signs of this trend reversing in the near future. Prudent policy makers will therefore have to prepare for a period of interstate military competition. The authors would like to thank Esther Chavannes, Gabriella Gricius, Paul Verhagen, and Rob de Wijk for their contributions. Lewis Carroll, Through the Looking-Glass and What Alice Found There (W.B. Conkey Co., 1900). The heads of state and government participating in the meeting of the North Atlantic Council in Brussels, “Brussels Summit Declaration,” June 11, 2018, link. David Shambaugh, “U.S. - China Rivalry in Southeast Asia: Power Shift or Competitive Coexistence,” International Security 42, no. 4 (2018): 85–127, link. “Summary of the 2018 National Defense Strategy,” 2018, 3. Thomas Wright, “The Return of Great Power Rivalry Was Inevitable”; Robert Kagan, Testimony of Dr. Robert Kagan, 3. Matthew L. Wald, “U.S. Nuclear Arms’ Cost Put at $5.48 Trillion,” July 1, 1998, link. QBE Insurance Group Ltd., “Understanding and Protecting Your Supply Chain: How to de-Risk Supply Chains in a World of Global Supply,” September 2018. Tim Sweijs et al., “Flow Security and Dutch Defence and Security Policies,” 2018, 90. Robert Jervis, Perception and Misperception in International Politics (Princeton University Press, 1976). Tim Sweijs, Arthur Usanov, and Rik Rutten, “Back to the Brink: Escalation and Interstate Crisis. HCSS Strategic Monitor 2016,” 2016, 36, link. Such upward pressure can typically only be constrained by a concerted effort on the part of participants through the imposition of formal and informal rules typically in the context of international regimes. Whether participants abide by such rules will be assessed in the international order section on interstate military competition through an evaluation of various arms control regimes. This paper focuses on trends in interstate military competition. In addition, of course, to the existence of shared interests. For more background on threat perceptions, capability development through balancing and state behavior, see Walt, Stephen M. Walt. The Origins of Alliances. Cornell University Press, 1987. For a critique and refinement, that calls attention to the domestic context, see Randall Schweller, “Unanswered Threats”; Daryl G. Press, Calculating Credibility. We acknowledge the importance of other states such as India, Japan, Iran, or Pakistan. Given the scope and limited resources for this paper, and the focus of the Strategic Monitor on Dutch national security interests, we have limited ourselves to this selection. We do not think that the key trends described in this paper would have been different if we were to have expanded our selection. We assessed this shift by using term frequency – inverse document frequency (known as tf-idf). This is essentially a measure of the relative importance of a word within a document. We assessed the tf-idf for a basket of terms that are characteristic of military competition and cooperation. We were inspired by a first approximation analysis of the US Defense Strategy 2018 conducted by Frank Hoffman (unpublished). Overall, the set of words associated with military competition increased in prominence compared to the set of words associated with cooperation. Analysis was done using custom-written R code, with two ‘baskets’ of words being used to operationalize verbal assertions of cooperation and conflict. The former ‘basket’ is made up of: cooperation, cooperative, cooperate, partner, partners, partnership, friend, friends, friendship, agree, agreement, peaceful, peace, harmony, balance, help, support, encourage, commitment, fair, justice, international law, promote, stable, positive sum, value, values, together; the latter out of: competition, compete, competitive, confrontation, opponent, adversary, enemy, opponents, adversaries, enemies, revisionist, dispute, multipolar, zero sum, great power, rival, rivalry, clash, contest, undermine, threaten, destruction, challenge, warning, threaten, refuse, deny, destroy, degrade, combat, attack, abuse, harm, struggle, war, race. The full results and code are available upon request. Some authors already made this observation prior to the overall re-assessment of Russia as a revisionist state in the Western discourse. See for instance Mark Smith and Conflict Studies Research Centre (Great Britain), A Review of Russian Foreign Policy (Watchfield, Swindon, England: Defence Academy of the United Kingdom, Conflict Studies Research Centre, 2007). “National Defense Strategy,” June 2008, 15. “The National Military Strategy of the United States of America” (Defense Technical Information Center, June 1, 2015), 3, link. “Summary of the 2018 National Defense Strategy,” 4. “China’s National Defense in 2008” (Information office of the state council, January 2009); “China’s National Defense in 2010” (Information office of the state council, March 31, 2011). “China’s Military Strategy” (The state council information office, May 2015), 2. “The Military Doctrine of the Russian Federation,” December 26, 2014, 2. “The Military Doctrine of the Russian Federation,” May 2, 2010, 2. Cabinet Office, “National Security Strategy and Strategic Defence and Security Review 2015: A Secure and Prosperous United Kingdom.,” 2015, 15; Cabinet Office, “National Security Strategy and Strategic Defence and Security Review 2015: First Annual Report 2016,” December 2016. The Federal Government of Germany, “White Paper on German Security Policy and the Future of the Bundeswehr,” 2016, 38. The Federal Government of Germany, 32. German Ministry of Defence - The Minister, “Defence Policy Guidelines - Safeguarding National Interests – Assuming International Responsibility – Shaping Security Together,” May 27, 2011, 2. “French White Paper: Defence and National Security,” 2013; “French White Paper: Defence and National Security,” 2017, 5, 37. Julian Cooper, “Russia’s State Armament Programme to 2020: A Quantitative Assessment of Implementation 2011–2015,” March 2016, 123. Reuters World News, “Putin Says Russia Was Ready for Nuclear Confrontation over Crimea,” March 15, 2015, link. David Nakamura and Anne Gearan, “In U.N. Speech, Trump Threatens to ‘totally Destroy North Korea’ and Calls Kim Jong Un ‘Rocket Man,’” September 2017, link. Jeff M. Smith, “China-India Relations After Doklam,” October 30, 2017, link. Angus Howarth, “Russia Claims ‘Confrontational Policy’ by US, UK and France over Syria Attack,” The Scotsman, April 2018, link. For an overview of the Methodology of GDELT, see The GDELT Project, “GDELT 2.0: Our Global World in Realtime,” February 19, 2015, link. In previous work, HCSS has identified ‘event codes’ from GDELT that represent assertive behavior. One subset of ‘assertiveness’ is the expression of negative forms of verbal assertiveness in the military domain, without necessarily leading to material actions. We look at the number of events for this subset of verbal events, and then represent that number as a percentage of all interstate events in that same time period. Given the enormous number of events in the data set, these percentages are extremely low, but they can still represent a large number of events, and thus changes over time can be quite significant. The following source provides a more elaborate explanation for how we assess assertiveness; Stephan De Spiegeleire et al., “Assessing Assertions of Assertiveness: The Chinese and Russian Cases” (The Hague Centre for Strategic Studies, 2014). After this paper, the methodology for assessing assertiveness has slightly changed. We use the following event codes to determine negative military rhetorical assertiveness: 1034 (Demand military protection or peacekeeping); 121 (Reject military cooperation); 1222 (Reject request for military aid); 138(Threaten to use military force, not specified below); 1382 (Threaten occupation); 1384 (Threaten conventional attack); 1385 (Threaten attack with WMD). The data for this section is taken from the Stockholm International Peace Research Institute (SIPRI) Military Expenditure Database; “SIPRI Military Expenditure Database: 1949-2017.” One important clarification is that this data concerns military spending specifically, not just the general budget for the Ministry of Defense. For instance, a country might not put its spending on pensions for veterans or paramilitary groups in its defense budget. A good illustration of this is France, where veteran pensions are excluded from the budget of the Ministry of Defense. This results in the allocated budget being substantially lower than the spending measured by SIPRI. See for instance Vladimir Jushkin, “What Is Hidden in Russia’s Military Budget,” May 2018, link. Office of the Under Secretary of Defense, “U.S. Department of Defense: Fiscal Year 2019 Budget Request,” February 2018. Pierre Tran, “France to Bolster Defense Spending by $2 Billion. Here’s the Military Equipment Already on Order,” October 26, 2018, link; Reuters, “German Leader, Defense Chief Vow Boost in Military Spending,” June 2018, link. Secretary of Defense Chuck Hagel, “Reagan National Defense Forum Keynote” (November 15, 2014), link. Office of the Secretary of Defense, “Nuclear Posture Review,” February 2018, XL. Office of the Under Secretary of Defense, “U.S. Department of Defense: Fiscal Year 2019 Budget Request”; Susanna V. Blume and Lauren Fish, “Overview of the 2019 President’s Budget Request for Defense,” February 15, 2018, link. Cade Metz, “Artificial Intelligence Is Now a Pentagon Priority. Will Silicon Valley Help?” August 26, 2018, link; See also Cade Metz, “Pentagon Wants Silicon Valley’s Help on A.I.,” New York Times, March 15, 2018, link. Congressional Research Service, “Defense Advanced Research Projects Agency: Overview and Issues for Congress,” July 24, 2018. F. Stephen Larrabee, ed., NATO and the Challenges of Austerity (Santa Monica, CA: RAND, 2012); Michael Shurkin, The Abilities of the British, French, and German Armies to Generate and Sustain Armored Brigades in the Baltics (RAND Corporation, 2017), link. Pierre Tran, “Macron Signs French Military Budget into Law. Here’s What the Armed Forces Are Getting.,” Defense News, July 16, 2018, link Attentive readers will have noticed that this increased spending s at odds with SIPRI’s estimate that France spent US$ 57.8 billion in 2018 - if that current level of spending would continue, that would be significantly more than US$ 295 billion in the next seven years. The reason these two estimates are compatible is because SIPRI takes into account spending paramilitary forces such as the National Gendarmerie, which fall outside of the defense budget but fall under the ministry of interior affairs. Pierre Tran, “A French Military Modernization Program Is Getting a Makeover,” Defense News, August 6, 2018, link. Julian Turner, “Intelligent Design: Inside France’s €1.5BN AI Strategy,” Global Defence Technology, 2018, link. Hans-Peter Bartels, “Information from the Parliamentary Commissioner of the Armed Forces: Annual Report 2017 (59th Report),” February 20, 2018. Donata Riedel, “Germany Outlines Radical Hike in Defense Spending,” Handelsblatt, September 4, 2018, link. Reuters, “German Military Has No Plans to Acquire Robot Weapons - General,” February 15, 2018, link. Andrew Chuter, “New UK Defense Agency to Oversee Nuclear Missile Subs Construction,” December 21, 2016, link. Ministry of Defence, “Combat Air Strategy: An Ambitious Vision for the Future,” February 2018, link; Gareth Corfield, “Britain to Slash F-35 Orders? Erm, No, Scoffs Lockheed UK Boss,” May 14, 2018, link. House of Commons Defence Committee, “Beyond 2 per Cent: A Preliminary Report on the Modernising Defence Programme,” June 12, 2018, 50. Malcolm Chalmers, “A Long and Winding Road: The UK’s Defence Review Could Last For Some Time Yet,” June 20, 2018, link. Malcolm Chalmers, “The UK Defence Modernisation Programme: A Risk and an Opportunity,” RUSI, January 25, 2018, link. Benjamin Kentish, “May Refuses to Say Britain Will Remain ‘tier One’ Military Power amid Reports She Forced Defence Secretary to Change Plans,” June 21, 2018, link. The European Commission, “EU Budget for the Future,” May 2018. Daniel Fiott, Antonio Missiroli, and Thierry Tardy, Permanent Structured Cooperation: What’s in a Name?, Chaillot Papers, No 142 (November 2017) (Paris: European Union Institute for Security Studies, 2017). Carolina Vendil Pallin and Fredrik Westerlund, “Russia’s War in Georgia: Lessons and Consequences,” Small Wars & Insurgencies 20, no. 2 (June 2009): 400–424, link. Richard Connolly and Mathieu Boulègue, “Russia’s New State Armament Programme,” May 2018, 42. Nicholas Myers, “Comparing Russia’s Military Modernization by Region-Balanced Efforts Across All Fronts,” July 11, 2018, link. The Associated Press, “Putin: Russia to Press Ahead with Military Modernization,” May 18, 2018, link. Julian Cooper, “The Funding of Nuclear Weapons in the Russian Federation” (Changing Character of War Centre, Pembroke College, University of Oxford, October 2018). Neil MacFarquhar and David E. Sanger, “Putin’s ‘Invincible’ Missile Is Aimed at U.S. Vulnerabilities,” March 1, 2018, link. RFE/RL’s infographics, “Up In Arms: Russia’s Massive Vostok-2018 War Games,” September 4, 2018, link. Gudrun Persson et al., “Russian Military Capability in a Ten-Year Perspective 2016,” 2016, 211. Karla Lant, “China, Russia and the US Are in An Artificial Intelligence Arms Race,” December 9, 2017, link. Daniel S Hoadley and Nathan J Lucas, “Artificial Intelligence and National Security,” April 2018, 42. Stephan De Spiegeleire, Tim Sweijs, and Matthijs Maas, Artificial Intelligence and the Future of Defense: Strategic Implication for Small- and Medium-Sized Force Providers (The Hague Centre for Strategic Studies, 2017). Anthony Cordesman of the Center for International and Strategic Studies writes that “every aspect of China’s strategy, the changes in its forces, and its military modernization is related to China’s view that China must pursue its interest in a troubled region, that it must be ready for conflict.” See Anthony Cordesman and Joseph Kendall, “Chinese Strategy and Military Modernization in 2016: A Comparative Analysis” (Center for Strategic and International Studies, December 5, 2016), 6. “What’s Driving Chinese President Xi Jinping’s Military Modernisation Push?,” South China Morning Post, January 8, 2017, link. “China’s Military Strategy.” Yang Yujun, spokesperson for China’s Ministry of National Defense, expressed that “Cutting the number of troops is conducive to pooling resources, speeding up the pace and improving the quality of informatization construction.”; Shannon Tiezzi, “The Real Reason China Is Cutting 300,000 Troops,” August 9, 2015, link; Adam Ni, “Why China Is Trimming Its Army,” The Diplomat, June 15, 2017, link. Kevin McCauley, “The PLA Accelerates Modernization Plans,” China Brief, December 1, 2018, link. Richard A. Bitzinger, “China’s New Defense Budget: Money and Manpower,” November 3, 2018, link. Anthony Cordesman and Joseph Kendall, “Chinese Strategy and Military Modernization in 2016: A Comparative Analysis,” 231. Stephen Kuper, “5th Generation Fighter Race Heats up for Industry Participation,” June 10, 2018, link. Ronald O’Rourke, “China Naval Modernization: Implications for U.S. Navy Capabilities--Background and Issues for Congress,” January 8, 2018, 126. Anthony H Cordesman, “Estimates of Chinese Military Spending,” 2016, 9. Eric Heginbotham et al., China’s Evolving Nuclear Deterrent: Major Drivers and Issues for the United States (RAND Corporation, 2017), link. Elsa Kania, “China May Soon Surpass America on the Artificial Intelligence Battlefield,” February 21, 2017, link. Michael Horowitz et al., “Strategic Competition in an Era Artificial Intelligence,” July 2018, link; Patrick Tucker, “China, Russia, and the US Are All Building Centers for Military AI,” Defense One, June 11, 2018, link. We use the definition of cyber-attacks from Thomas Rid, who writes that, “cyber-attacks are merely sophisticated versions of three activities that are as old as warfare itself: subversion, espionage, and sabotage”. For an elaborate explanation of Rid’s definitions of cyber war and attack, see: Thomas Rid, “Cyber War Will Not Take Place,” Journal of Strategic Studies 35, no. 1 (February 2012): 5–32, link. Ellen Nakashima and Paul Sonne, “China Hacked a Navy Contractor and Secured a Trove of Highly Sensitive Data on Submarine Warfare,” July 8, 2018, link. T M Chen and S Abu-Nimeh, “Lessons from Stuxnet,” Computer 44, no. 4 (April 2011): 91–93, link. Andy Greenberg, “How an Entire Nation Became Russia’s Test Lab for Cyberwar,” Wired, June 20, 2017, link. In the following article, Maness and Valeriano share their methodology for constructing the datasets: Brandon Valeriano and Ryan C Maness, “The Dynamics of Cyber Conflict between Rival Antagonists, 2001–11,” Journal of Peace Research 51, no. 3 (May 2014): 347–60, link; Another example of a quantitative measure of cyber incidents is made by Council on Foreign Relations, “Global Cyber Operations Tracker,” 2018, link. Lucas Kello, “The Meaning of the Cyber Revolution: Perils to Theory and Statecraft,” International Security 38, no. 2 (October 2013): 9, link. Anthony Craig, “Understanding the Proliferation of Cyber Capabilities,” October 18, 2018, link. Achieve and Maintain Cyberspace Superiority: Command Vision for US Cyber Command. 23 Mar. 2018. p.5. Alexandra Brzozowski, “NATO Sees New Cyber Command Centre by 2023 as Europe Readies for Cyber Threats,” Euractiv.com, August 17, 2018, link. NATO, “Secretary General Thanks President Macron for His Personal Commitment to the Transatlantic Relationship,” May 15, 2018, link. Anna-Maria Osula. “National Cyber Security Organisation: United Kingdom.” NATO Cooperative Cyber Defence Centre of Excellence, November 2014. Zi Yang, “China Is Massively Expanding Its Cyber Capabilities,” October 3, 2017, link. Alexander Klimburg and Louk Faesen, “A Balance of Power in Cyberspace” (The Hague Centre for Strategic Studies Paper Series, June 15, 2018), 4 This paper also gives a more elaborate overview of the barriers associated with assessing cyber-capabilities. BBC World News, “Ethiopia and Eritrea Blame Each Other for Border Clash,” June 13, 2016, link. Council on Foreign Relations - Global Conflict Tracker, “Conflict Between India and Pakistan,” 2018, link. The Heidelberg Institute for International Conflict Resarch classified the issue of US–Mexico as a border dispute because “the United States Border Patrol apprehended more than 300.000 people at its southwest border. Of these, about 42 percent were Mexican”; The Heidelberg Institute for International Conflict Research, “Conflict Barometer 2017,” 2017, link. Daniel Byman, “Why States Are Turning to Proxy War,” August 26, 2018, link; See also Daniel Byman, “Why Engage in a Proxy War? A State’s Perspective,” May 2018, link. Reuters World News, “Russia Establishing Permanent Presence at Its Syrian Bases: RIA,” December 26, 2017, link; International Crisis Group, “Iran’s Priorities in a Turbulent Middle East,” April 13, 2018, link; Ben Hubbard, Isabel Kershner, and Anne Barnard, “Iran, Deeply Embedded in Syria, Expands ‘Axis of Resistance,’” February 19, 2018, link; Stephane Delory and Can Kasapoglu, “Iran’s Rising Strategic Foothold in Syria” (Founation pour la recherche, January 2018), link. Elizabeth Tsurkov, “Inside Israel’s Secret Program to Back Syrian Rebels,” June 9, 2018, link. Adam Enthous, “Donald Trump’s New World Order,” June 18, 2018, link. Dmitry Dima Adamsky, “Moscow’s Syria Campaign: Russian Lessons for the Art of Strategy,” June 2018, 36. “A Growing Number of Countries Interested in the Russian S-400 Triumf Air Defence System After Its Performance in Syria,” January 24, 2018, link. For an overview of sources, see Council on Foreign Relations, “Not the Cyber Deterrence the United States Wants,” June 2018, link. Thomas Frear, “Lessons Learned? Success and Failure in Managing Russia-West Incidents 2014-2018: Euro-Atlantic Security Policy Brief,” April 2018, link. Justin Bronk, “Analysis: Downing of Russian Jet Hardly a Surprise,” November 25, 2015, link. Julian Borger and Marc Bennetts, “Scores of Russian Mercenaries Reportedly Killed by US Airstrikes in Syria,” February 2018, link. Hannah Beech, “China’s Sea Control Is a Done Deal, ‘Short of War With the U.S.,’” September 20, 2018, link; Reuters, “China Condemns U.S. for South China Sea Freedom of Navigation Operation,” October 1, 2018, link. NATO, “Boosting NATO’s Presence in the East and Southeast,” September 10, 2018, link. Jacob Kastrenakes, “Trump Signs Bill Banning Government Use of Huawei and ZTE Tech,” August 13, 2018, link. Ana Swanson, “Trump Blocks China-Backed Bid to Buy U.S. Chip Maker,” September 13, 2018, link. Some authors find a negative effect of military spending on economic growth (for instance, Giorgio d’Agostino, J. Paul Dunne, and Luca Pieroni, “Does Military Spending Matter for Long-Run Growth?,” Defence and Peace Economics 28, no. 4 [July 4, 2017]: 429–36, link; However, other authors find that this relationship varies per country type, and is positive for high-income countries (Pei-Fen Chen, Chien-Chiang Lee, and Yi-Bin Chiu, “The Nexus between Defense Expenditure and Economic Growth: New Global Evidence,” Economic Modelling 36 [January 2014]: 474–83, link; A meta-analysis of 32 studies wtih 169 estimates finds the relationship to be non-linear but positive for developed countries (see Aynur Alptekin and Paul Levine, “Military Expenditure and Economic Growth: A Meta-Analysis,” European Journal of Political Economy 28, no. 4 [December 2012]: 636–50, link. For an overview of such violations, see; Save the Children International, “The War on Children,” 2018; “Convention on Cluster Munitions,” May 30, 2018, link; “Convention on the Prohibition of the Development, Production, Stockpiling, and Use of Chemical Weapons and on Their Destruction,” July 29, 2005, link.